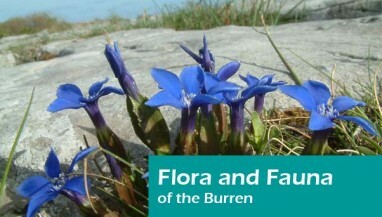 The landscape of the Burren has been shaped by geological forces for hundreds of millions of years. The story begins in a tropical sea near the equator, includes the development of a major river delta, migration and collision of continents, the expansion and contraction of the polar ice caps and last but not least, the rain that sweeps in from the Atlantic. 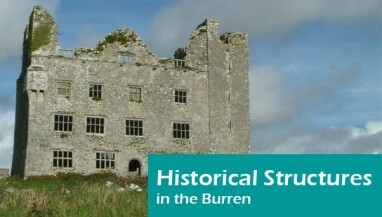 The rocks that make up the Burren were all formed during the Carboniferous period between 359 and 299 million years ago. This geological period is named for all the coal deposits in North America, UK and Europe that were formed at this time. 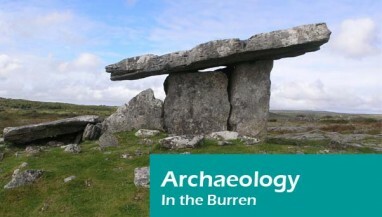 In the Burren are there are two major rock types; the lighter coloured limestones to the north and east and the darker siltstones, shales and sandstones to the south west. The limestones which make up the typical bare Burren landscape were buried by the slightly younger siltstones and sandstones which make up the Cliffs of Moher. The different rock types were formed under different conditions; the limestones, which contain fossil corals, crinoids and brachiopods were formed in a warm tropical sea near the equator, very much like the Bahamas today. The limestones were deposited slowly over a very long period of time, around 20 million years and much of the rock is actually made up of little bits of broken fossils. The shales, siltstones and sandstones that make up the Cliffs of Moher and the area south west of Lisdoonvarna and Kilfenora were formed much more rapidly from sand and silt being washed into the sea by a major river system which has long since disappeared. Fossils are not common in these rocks although the traces left by creatures that crawled through the mud are readily seen in the famous Moher flagstones. 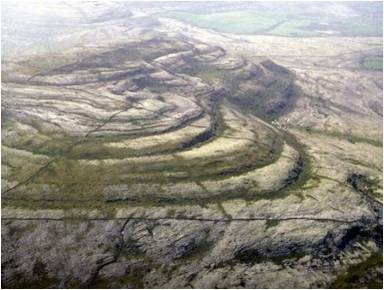 Shortly after these rocks were formed the entire continent collided with what is now Europe, this caused the rocks ,which were originally horizontal, to become gently folded as we can see at Mullaghmore, in fact all the rocks of the Burren are tilted slightly to the south. The enormous forces that caused the folding are also responsible for the many cracks and fissures the run through the limestone now. Much later, only about 2 million years ago the ice age started in northern Europe. Huge masses of ice over 200m thick came from the north and north east and scoured the surface ripping up soil and rock and carving valleys and then depositing the rocks and clay as the ice melted. We can see these rocks scattered across the Burren as glacial erratics today. Along the coast there are many rocky beaches where it is possible to find rocks which are not originally from the Burren, these granites, red sandstones and others were carried by the ice from Connemara and east Clare and have been eroded by the sea from the glacial deposits left by the ice. The last Ice age ended around 15,000 years ago. Since then the rain has been quietly dissolving the limestone and widening the fissures and also forming many of the caves we see all through the Burren. The rain continues to slowly dissolve the limestone today. 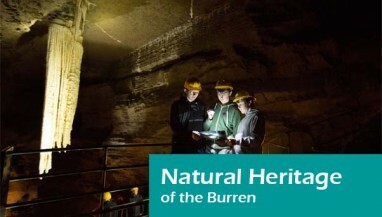 The combination of features formed by rain and ice are known as a glaciokarst landscape and the Burren is a globally significant example which was awarded Geopark status in 2011. Let’s have a closer look at the rocks and how they got here.. It is a warm day somewhere close to the equator and the crystal clear sea extends as far as the eye can see. The wind is making waves, there are clouds in the sky. The sea floor is visible through the waves as white and cream coloured patches of sand but there is no land in sight. We are adrift in a tropical sea. We dive beneath the waves. Suddenly a whole new world of colour and life is visible! There are creatures everywhere; brachiopods the size of small saucers sit in the white mud, like oysters or mussels their two shells open slightly to allow them collect plankton from the seawater. There are mini forests of crinoids; these small stalked creatures are attached to the sea floor but some can release themselves and move for short distances. Their ‘heads’ looks like feathery flowers, waving in the water to collect food particles. There are corals here too, not the big complex reefs that we see along the great barrier reef but smaller clusters and groups attached to the sea floor. Some of these corals are a metre wide, they are the branching colonial corals and the tip of each branch contains a corallite that collects food. There are also smaller individual or solitary corals, they look like small cow horns that have been turned upside down and stuck into the sea floor. Every now and then a fish swims past and we also see coiled shells swimming in the water, these are the Goniatites; propelled by underwater jet propulsion, they are relatives of the Nautilus and related to octopus and squid. They have good eyes and are fierce predators, actively hunting other swimming creatures, they catch them with their tentacles are kill with a bite from their beaks. The sea floor itself is a patchwork of colours, there are some patches of loose white sand, in other places the sand has been colonised by a variety of red and green algae, encrusting bryozoa, and a myriad of organisms known as foraminifera that live in beautiful but microscopic shells. A closer look at the white sand reveals that the individual grains are made up of tiny shells and fragments of crinoids and other bits and pieces of the shells of dead animals. Every now and then a wave moves the sand, it rolls the grains back and forth and makes ripples just like you see on any beach at home. If a storm comes the much bigger waves will completely rearrange all this, ripping up living corals, crinoids and brachiopods and moving them along the seafloor for hundreds of metres, eroding and mixing them with other sand until eventually the storm passes and everything will settle back to be colonised again. These living creatures extract calcium carbonate (CaCO3) from the seawater to make their shells. As they get buried they are cemented together by more calcium carbonate which precipitates out of the water buried with them and binds the grains together. This is how the shells become the grains and fossils in the rock we know as limestone.